Galloway, an extensive district in the south-western corner of Scotland, which originally and for a considerable period included also parts of Ayrshire and Dumfriesshire, has for ages past been identified simply and strictly with the shire of Wigtown and the stewartry of Kirkcudbright. The name, though inextricably interwoven with Scottish history, designates no political jurisdiction, and is unsanctioned by the strict or civil nomenclature of the country. The district is bounded on the N by Ayrshire and Dumfriesshire, on the E by Dumfriesshire, on the S by the Solway Firth and Irish Sea, and on the W by the Irish Channel and Firth of Clyde. Its greatest length, from E to W, is 63½ miles; and its greatest breadth, from N to S, is 43 miles. It is divided into three districts – Upper Galloway, including the northern and more mountainous parts of the two shires; Lower Galloway, embracing the southern and lowland sections E of Luce Bay; and the Rhinns of Galloway, consisting of the peninsula SW of Luce Bay and Loch Ryan. Galloway has long been famous as an excellent pastoral district; and though its unsettled condition long kept its agriculture in a backward state, the last hundred years have seen splendid progress made. The Galloway breed of horses is celebrated, and large droves of polled black cattle used to be reared for the southern markets. Of late, however, Ayrshire cattle have been superseding the native breed; and dairy-farming is coming into favour. The absence of coal, lime, and freestone has protected Galloway from the erection of busy industrial or manufacturing centres. The surface, on the whole, is undulating; and to quote Mr Henry Inglis, ‘there is no district of Scotland more rich in romantic scenery and association, few which possess the same combination of sterile grandeur and arcadian beauty, and fewer still which are blessed with a climate equal in mildness of temperature to that of Galloway. The tulip-tree flourishes and flowers at St Mary’s Isle, and the arbutus bears fruit at Kirkdale.’ But for all save historical details, we must refer to our articles on Kirkcudbrightshire and Wigtownshire.The district, afterwards called Galloway, was in early times held by tribes of the nation of the Brigantes. Ptolemy, writing in the 2d century of our era, calls them Novantes and Selgovæ The former occupied the country W of the Nith, and had two towns – Lucopibia at Whithorn, and Rerigonium on the E shore of Loch Ryan. The Selgovæ or Elgovæ lay to the E, extending over Dumfriesshire, and their towns were Trimontium, Uxellum, Corda, and Carbantorigum, whose sites Dr Skene finds respectively on Birrenswark Hill, on Wardlaw Hill, at Sanquhar, and at the Moat of Urr, between the Nith and Dee. A large amount of ethnological controversy has been waged over these peoples; some authorities recognising in them a Gothic, others a Cymric, and others a Gaelic, race. The authority we have just named considers them to have been Celtic tribes of the Gaelic branch. Intercepted by the Britons of Strathclyde from their northern Gaelic relations, and surrounded in their little corner by a natural girdle of sea and mountain, this people long retained their individuality. They were known as the Picts of Galloway centuries after the word Pict had disappeared elsewhere from the country; and they appeared under that name as a division of the Scottish army at the Battle of the Standard in 1138. We know little concerning Galloway in Roman times. Agricola, overrunning it in 79 a. d., added it to the Roman province in Britain, and Roman military remains are tolerably frequent in certain districts. In 397 it is related that St Ninian built a church at Candida Casa, formerly Lucopibia, dedicated it to St Martin of Tours, and began the conversion of the Picts. After the departure of the Romans from Britain, Galloway appears, from the evidence of topographical names and old chronicles, to have been governed by a series of Pictish kings; but probably early in the 7th century the Northumbrian rulers of Bernicia brought it under their sovereignty, and for several centuries remained the nominal superiors of its lords. There is no authority for the common narrative of immigrations of Irish Celts into Galloway during the 8th and following centuries. It is at this period that the modern name emerges. The district was known to the Irish as Gallgaidel or Gallgaidhel, and to the Welsh as Galwyddel, from the Celtic gall, ‘a stranger; ‘and the name, besides indicating the land of strangers, seems to have some reference also to the fact that the Gaelic population was under the rule of the Anglian Galle or strangers. From the above terms came Gallweithia, Galwethia, and many other forms, Latinised as Gallovidia, and appearing now as Galloway. Towards the end of the 8th century the power of the Angles began to decline. Bede, who gives to the Gallowegian Picts the alternative name of Niduari from Nid or Nith, like Novantæ from Novius, the name under which Ptolemy knew the same river, relates that one of the four bishoprics into which Northumbria was divided had its seat at Candida Casa. The first bishop was appointed in 727; the Angles appear to have been too weak to appoint another after Beadulf about 796. The Northmen, who first appeared in England in this century, did not overlook Galloway; and there is some ground for believing that the Gallowegians themselves partly adopted a piratical life. During the next two or three centuries Galloway was probably ruled by native rulers in tolerably complete independence; and it had the honour of being the locality whence Kenneth mac Alpin emerged to obtain the throne of Scotia. About the middle of the 11th century the name Galweya was used to include the whole country from Solway to Clyde. In the Orkneyinga Saga, which narrates the history of the Norwegian Jarl Thorfinn, a contemporary of Macbeth, Galloway is referred to under the name of Gadgeddli; and it probably formed one of the nine earldoms that Thorfinn possessed in Scotland. Malcolm Ceannmor, who succeeded to the throne of Scotia in 1057, recovered Galloway from the Norse supremacy, though it is probable that many Northmen remained in the district. In 1107, David, youngest son of Malcolm Ceannmor, received Scotland S of the Forth and Clyde as an earldom; and in the charter which he granted in 1113 to the newly-founded monastery of Selkirk, he assigned to the monks the tenth of his ‘can’ or dues from Galweir. David’s ascent of the Scottish throne in 1124 may be regarded as the date of the union of Galloway with Scotland. Various attempts have been made to furnish Galloway with a line of independent lords during the earlier parts of its obscure history, and we even hear of a certain Jacob, Lord of Galloway, as having been one of the eight reguli who met Edgar at Chester in 973. But all these efforts are entirely unauthentic, and are based upon comparatively modern authorities. From the reign of David I. we are on more historical ground. After the death of Ulgric and Duvenald, described as the native leaders of the Galwenses, at the Battle of the Standard in 1138, Fergus, who may possibly have been of Norwegian connections, was appointed first Earl of Galloway. This powerful noble married Elizabeth, a natural daughter of Henry I. of England. In 1160 he joined Somerled, Norse ruler of Argyll, in a revolt against Malcolm IV., but was subdued after three battles and compelled to resign his lordship to his sons. He retired as canon regular to Holyrood, where he died in the following year. His gifts and endowments to Holyrood Abbey were very extensive; and that house possessed more lands in the stewartry than any other. Uchtred and Gilbert, sons and successors of Fergus, accompanied King William the Lyon on his expedition to England in 1173; but when he was taken prisoner they hurried home, expelled with cruel slaughter the English and Norman inhabitants of Galloway, and attempted to establish their independence of the Scottish government, even offering to swear fealty to England. William, on his release in 1174, marched at once to Galloway, where, however, Gilbert, who had cruelly murdered his brother at Loch Fergus, made humble submission and gave hostages. Gilbert died in 1185, and Roland, son of the murdered Uchtred, succeeded, after first quelling a revolt under Gilpatrick, and subduing Gilcolm, a powerful freebooter, who had invaded Galloway. Duncan, the son of Gilbert, received the earldom of Carrick. Roland married Elena, daughter of the Constable of Scotland, and eventually succeeded to his father-in-law’s high office. It is said that Roland swore allegiance to Henry II. of England for the lands of Galloway, and that the English monarchs continued to look upon that district as part of their lawful dominions. Alan succeeded his father in 1200 as Lord of Galloway. He assisted King John in his Irish expedition in 1211, and appeared as one of the barons who extorted the Magna Charta from that king. Later, however, he returned to his Scotch allegiance, and succeeded to his father’s office of constable. He died in 1234, leaving three daughters and an illegitimate son. On the king’s refusal either to accept the lordship himself or to prevent the partition of the land among the Norman husbands of the three heiresses, the Gallowegians rose in fierce revolt, and were with difficulty reduced to obedience in 1235. Roger de Quincy, husband of Elena, Alan’s eldest daughter, received the lordship. This strict enforcement of the rule of legitimate succession marks the transition in Galloway from the Brehon law to feudalism. From that date lands began to be held by charter and lease, the rights of property began to be more secure, and agriculture began to be attempted. De Quincy died in 1264. In 1291, when the Scottish succession was disputed after the death of the Maid of Norway, one-half of the lordship of Galloway belonged to John Baliol, a son of Alan by Margaret, granddaughter of David I.; the other half was shared by William de Ferrers, Alan de Zouch, and Alexander Comyn, Earl of Buchan, husbands of the three daughters of De Quincy. Of the three last Comyn alone is of importance in the history of Galloway. The Gallowegians, during the wars of the succession, naturally sided with the Comyns and the Baliols, and speedily shared in their disasters. When John Baliol was obliged to resign his dependent crown, Edward I. considered Galloway as his own; and he immediately appointed over it a governor and a justiciary, disposed of its ecclesiastical benefices, and obliged the sheriffs and bailiffs to account for the rents and profits of their bailiwicks in his exchequer at Berwick. In 1296 he granted to Thomas of Galloway all the lands, etc., that had been granted to him there by his father Alan; and at the same time he restored all their former liberties and customs to the men of Galloway. In 1297, Wallace is said to have marched into the west ‘to chastise the men of Galloway, who had espoused the party of the Comyns, and supported the pretensions of the English;’ and a field in the farm of Borland, above the village of Minnigaff, still bears the name of Wallace’s camp. During his campaign of 1300, Edward I. marched from Carlisle through Dumfriesshire into Galloway; and though opposed first by the remonstrances, and next by the warlike demonstrations of the people, he overran the whole of the low country from the Nith to the Cree, pushed forward a detachment to Wigtown, and compelled the inhabitants to submit to his yoke. In 1307, Robert I. marched into Galloway, and wasted the country, the people having refused to repair to his standard; but he was obliged speedily to retire. In the following year, Edward Bruce, the king’s brother, invaded the district, defeated the chiefs in a pitched battle near the Dee, overpowered the English commander, reduced the several fortlets, and at length subdued the entire territory. Galloway was immediately conferred on him by the king, as a reward for his gallantry; but after the death of Alexander, his illegitimate son, whom the king had continued in the lordship, in 1333, it reverted to the crown. When Edward Baliol entered Scotland to renew the pretensions of his father, Galloway became again the wretched theatre of domestic war. In 1334, assisted and accompanied by Edward III., he made his way through this district into the territories to the N, and laid them waste as far as Glasgow. In 1347, in consequence of the defeat and capture of David II. at the battle of Durham, Baliol regained possession of his patrimonial estates, and took up his residence in Buittle Castle, the ancient seat of his family. In 1347, heading a levy of Gallowegians, and aided by an English force, he invaded Lanarkshire and Lothian, and made Scotland feel that the power which had become enthroned in Galloway was a scourge rather than a protection. In 1353, Sir William Douglas overran Baliol’s territories, and compelled M’Dowal, the hereditary enemy of the Bruces, to renounce his English adherence and swear fealty to his lawful sovereign. After the restoration of David II. and the expulsion of Baliol, Archibald Douglas, the Grim, obtained, in 1369, Eastern and Middle Galloway, or Kirkcudbrightshire, in a grant from the crown, and, less than two years after, Western Galloway, or Wigtownshire, by purchase from Thomas Fleming, Earl of Wigtown. This illegitimate but most ambitious son of the celebrated Sir James Douglas obtained, at the death of his father, in 1388, on the field of Otterburn, the high honours and the original estates of the house of Douglas; and now, while holding in addition the superiority of all Galloway, became the most powerful as well as the most oppressive subject of Scotland. On an islet in the Dee, surmounting the site of an ancient fortlet, the residence of former lords of Galloway, he built the strong castle of Threave, whence he and his successors securely defied the enemies that their violence and oppression raised against them. About the middle of the 15th century one of those earls of Douglas and lords of Galloway carried his lawless insolence so far as, on the occasion of a quarrel, to seize Sir Patrick Maclellan of Bombie, the sheriff of Galloway, and to hang him ignominiously as a felon in Threave Castle. The Douglases experienced some reverses, and were more than once sharply chastised in their own persons, yet they continued to oppress the Gallowegians, to disturb the whole country, and even to overawe and defy the crown, till their turbulence and treasons ended in their forfeiture. James, the ninth and last earl, and all his numerous relations, rose in rebellion in 1453; and, two years afterwards, were adjudged by parliament, and stripped of their immense possessions. The lordship of Galloway with the earldom of Wigtown was annexed to the crown, and in 1469 was conferred, with other possessions, upon Margaret of Denmark, as part of her dowry when she married James II. But although the king had introduced a milder and juster rule, the troubles of Galloway were not yet over. For some time after the fall of the Douglases it was occasionally distracted by the feuds of petty chiefs, familiarly known by the odd name of ‘Neighbour Weir.’ Early in the 16th century a deadly feud between Gordon of Lochinvar and Dunbar of Mochrum led to the slaughter of Sir John Dunbar, who was then steward of Kirkcudbright; and, during the turbulent minority of James V., another feud between Gordon of Lochinvar and Maclellan of Bombie led to the slaughter of the latter at the door of St Giles’s Church in Edinburgh. In 1547, during the reign of Mary, an English army overran Eastern Galloway, and compelled the submission of the principal inhabitants to the English government; and after the defeat of Langside, Mary is falsely said to have sought shelter in Dundrennan Abbey, previous to her flight into England across the Solway. In the following month (June 1568) the regent Moray entered the district to punish her friends; and he enforced the submission of some and demolished the houses of others. In 1570, when Elizabeth wished to overawe and punish the friends of Mary, her troops, under the Earl of Moray and Lord Scrope, overran and wasted Annandale and part of Galloway. As the men of Annandale, for the most part, stood between the Gallowegians and harm, they expected to receive compensation from their western neighbours for their service; and when they were refused it, they repaid themselves by plundering the district. The people of Galloway warmly adopted the Covenant, and suffered much in the religious persecutions of the time. The story of the martyrs of Wigtown will be told elsewhere. The rising that was crushed by General Dalziel, in 1666, at Rullion Green had its beginning at Dalry in Kirkcudbrightshire. Among the strict Cameronians and ‘wild western Whigs,’ the men of Galloway were represented. In a happier age Loch Ryan sheltered William III.’s fleet on his voyage to Ireland in 1690; and since then the history of Galloway has mainly consisted in the advance of agriculture and of the social condition of the people. Galloway gives name to a synod of the Church oh Scotland, a synod of the Free Church of Scotland, and to a presbytery of the United Presbyterian Church. The former synod, meeting at Newton-Stewart, and including the presbyteries of Stranraer, Wigtown, and Kirkcudbright, comprises the whole of Wigtownshire and all Kirkcudbrightshire W of the river Urr, besides Ballantrae and Colmonell parishes in Ayrshire. Pop. (1871) 67, 280, (1881) 66, 736, of whom 14,402 were communicants of the Church of Scotland in 1878. The Free Church synod, having the same limits, with the exclusion of the two Ayrshire parishes, and divided into three presbyteries of the same names as above, had 4512 members in 1881; whilst the United Presbyterian presbytery had 1704 in 1880. The pre-Reformation Church of Scotland had a see of Galloway, with a church at Whithorn; and the present Roman Catholic Church has a diocese of Galloway, re-established in 1878. The Episcopal Church has a united diocese of Glasgow and Galloway. See Andrew Symson’s Description of Galloway mdclxxxiv. (Edinb. 1823); Thomas Murray’s Literary History of Galloway (Edinb. 1822); William Mackenzie’s History of Galloway (2 vols., Kirkc., 1841); Sir Andrew Agnew’s History of the Hereditary Sheriffs of Galloway (Edinb. 1864); P. H. MacKerlie’s History of the Lands and their Owners in Galloway (5 vols. Edinb., 1870-78); Malcolm Harper’s Rambles in Galloway (Edinb. 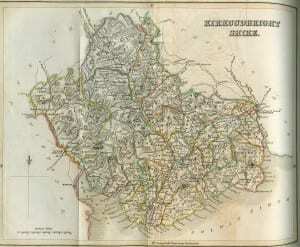 1876); and works referred to under Kirkcudbrightsihire and Wigtownshire. Note: This text has been made available using a process of scanning and optical character recognition. Despite manual checking, some typographical errors may remain. Please remember this description dates from the 1880s; names may have changed, administrative divisions will certainly be different and there are known to be occasional errors of fact in the original text, which we have not corrected because we wish to maintain its integrity.